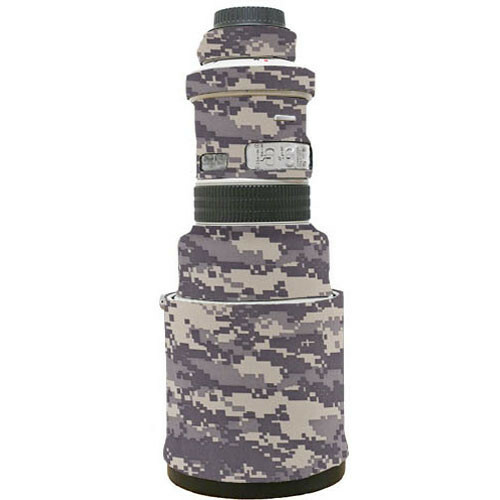 The digital camo Lens Cover for the Nikon 400mm f/2.8 VR Lens from LensCoat is a 100% closed-cell neoprene coat that protects the lens from bumps and scratches. It is useful for nature and outdoor photographers, as well as sports shooters and photojournalists. It provides a thermal barrier, protecting your hands from cold lens surfaces in low temperatures. The cover is waterproof, providing protection to your lens in wet conditions. It is easy to install and remove, leaving no residue on the lens. This cover can also help you preserve the resale value of the lens. Digital Camo is an advanced computer generated pattern modeled after the U.S. Army's standard-issue ACU pattern. It features pixelated rectangles to maximize visual break up. The pattern mimics naturally occurring dappled textures and rough boundaries. Box Dimensions (LxWxH) 8.3 x 7.0 x 1.2"
Lens Cover for the Nikon 400mm f/2.8 VR Lens (Digital Camo) is rated 4.6 out of 5 by 8. Rated 5 out of 5 by Fly to Water Photography from A Solid Product This product is expensive given the cost of neoprene, but remains the best option I'm aware of for easy, removable lens camouflage. The templates used by LensCoat for cutting, sewing, and punching are precise. It takes about 5 minutes to install on the Nikon 400mm f/2.8 VR. Fit is firm, but not so tight that you risk tearing the neoprene.The RealTree Max4 is a good choice for wetlands or fall forests.Despite the weight of the 400mm, I hand hold this lens frequently. I appreciate the fact that neoprene insulates my hands from the metal lens housing, which cools rapidly. While hand holding, I also tend to rest the lens hood once in a while on handy objects like branches. It's nice to have a little padding and protection considering the cost of the hood. Rated 4 out of 5 by Dan from Protective, yet easy to get on and off To begin, this LensCoat cover fits around the largest of the two lens hoods for the Nikon 400mm 2.8 VR. It is too big for the lens alone. The best features about it are the ease of getting it on and off, and that it is far less bulky than the Nikon-provided cover. It is adequate protection for someone who is careful with their lenses, but the plastic disk inside the cover is not quite as stiff as the one in the Nikon-provided cover, and it you press on it the LenCoat cover will touch the front element. I do not think this is a problem, but I do wish the plastic disk inside had a little less flex. Rated 5 out of 5 by Dutch from Almost Perfect I like things to maintain value, my 400 is an expensive hunk of glass that if it weathers time well, will hold it's value. This cover does what its advertised to do. I do not care for the sticky backed neoprene for the foot (did not use it) and the band that covers the controls is a bit awkward. Rated 5 out of 5 by Phairoj from Cannot imagine life with out one Would you risk a US$10,000 lens shooting wildlife in the rainforest without a protection!! No, that would be silly, wouldn't it?I found this LensCoat lens cover is the solution. Rated 4 out of 5 by Birdsta from Does what it's supposed to do. I use this product on my Nikon 400 which I use primarily for shooting birds. It's very useful in protecting my gear from scratches and scapes in the bush. Rated 5 out of 5 by Pete from Easy to used After worn it to the lens, lens look very good. Material of lens cover very soft and protect lens from bumps and scratched well. Rated 5 out of 5 by G-Forcephoto from Essential protection for expensive glass Easy to fit and great protection for my 400mm 2.8. Will this fit the 400mm f2.8E FL ED VR?